Back in 2006, the second year of this blog, I wrote about a simple time boxing concept called the Power of 48 Minutes. It’s a technique that I had learned from a presenter at a speaker’s conference. Simply put, you turn off all distractions, set a timer for 48 minutes and work on one and only one thing until the timer goes off. Then you take a 12-minute break. You can repeat this as many times as needed. Since 2006, I have used the time-box system hundreds of times. The technique has significantly enhanced the way that I work and has led to the creation of a simple, yet efficient, personal time management system. Over the years, I’ve tweaked the plan and made some simple changes. 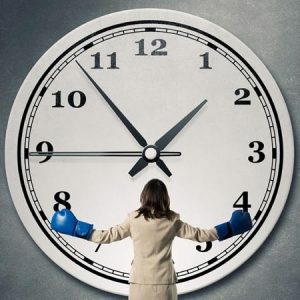 I currently use a 50-minute time block, with a 10-minute break, as I find that this is easily divided into five and ten-minute increments, which better matches the numbers on the clock. Early on I used an egg timer, but the constant ticking drove me nuts. I now use a digital timer which is completely quiet. I’ve developed some worksheets which allow you to easily divide fifty minutes into five and ten-minute segments for greater flexibility. I am currently using the Mastery Journal from podcaster, John Lee Dumas, to improve my focus and productivity in a 100-day challenge. The journal is set up with four, time-block sessions per day, which ties in perfectly with the 50/10 system. Over the years, I found situations where fifty minutes was not enough to complete a task, and that stopping in the middle was disruptive. For those cases, I just use multiples of fifty. One hundred minutes with a twenty-minute break works well (100/20), and I’ve found I can even go out to one hundred and fifty minutes with a thirty-minute break (150/30) for really long projects. This time box procedure has helped me complete many projects over the years. I’ve used it to write six books, and I continue to use it on my current fiction book project. It has helped me greatly with this blog and my Daily Drivecast Podcast. I’ve even used it for housecleaning and yard maintenance. The time box procedure works because humans are not designed to be multitaskers. With cell phones, email, and the constant barrage of social media, this simple time-box technique can double or even triple your productivity, depending on how distracted you are. I challenge you to try it and see if it makes as profound a difference in your life as it has in mine. Is there magic in the number 48? Does this number hold any significance in your future success? Speaker Don Crowther suggests that there is. In his presentation at the NSA Summer Symposium, Don told the audience that 48 minutes is the magic number. Here’s how it works… Set a timer for 48 minutes. Close out all distractions and work continuously for 48 minutes. When the timer goes off, get up and stretch, get coffee, use the restroom, etc, in the following 12 minutes. Repeat as necessary. Don reports that this technique repeated four times a day allowed him to write a 150-page book in just two weeks. The ability to focus on one task for 48 minutes straight was the key. I have been testing Don’s idea, and I have to say it works well for me. This eliminates the distractions that have a way of derailing even the best-laid plans. Taking a short 12-minute break once an hour is refreshing but not enough to get you off track. You can learn to stay focused quickly with this method. So the question comes up If this solution works well how can I use it in planning out my daily schedule and applying it to future goals. Can I successfully write a blog post in 48 minutes? Can I write a book chapter in that time? As I’ve tried the process, it has been a challenge to sit in one place that long. But when I do my productivity soars. I find it best just to keep writing, not worry about mistakes, and get everything on paper. Once I have the points on paper, I can go back and make my edits and corrections. My usual morning schedule has about 2 hours of productive time available. I’ve tested the idea of blogging for an hour and then working on a book for the second hour. So far this has worked well with standard length blog posts and has yielded a book outline. There does seem to be magic in the number 48! This technique does require a little planning, and it helps to have a coffee cup warmer on your desk. The best timer I’ve found so far is a countdown timer with large numbers and a loud alarm. The easy to view numbers give instant feedback on how much time you have left. Using this simple technique may help me streamline my daily blog postings and help me be much more consistent. The book outline is taking shape and given me hope of actually completing the project. Update: The Power of 48 Minutes helped me write my first book (first draft) in a little over three months utilizing this method for two hours per day. Currently, it allows me to focus on my new book and easily get my 1,000 words in per day. It’s quite easy to learn how to stay focused. If you find yourself getting distracted by your projects, give this simple technique a try. It has helped me focus and get things done! Discover more about the Power of 48 Minutes here. Monday Motivation has been a popular hashtag on Twitter for years. The idea is to start your week with on a positive note. Many people post quote graphics, with stunning images and powerful quotations. 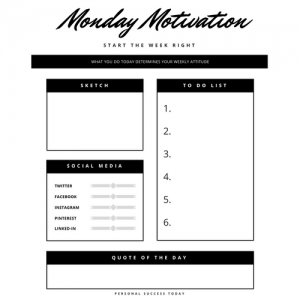 As a blogger, I decided to create a Monday Motivation Worksheet to give me a place to quickly plan out my week with a positive quote, a quick sketch, and a short action list and have a check-off list of social media sites where I can share the positive message. After a few tweaks, I have a working model, that I can share with you. It’s a free download in PDF format that prints out on standard letter size paper. The best way to start your Monday Morning is with a positive quote. The worksheet has a box at the bottom for this. Just grab a pen or Sharpie and fill it in. I find this sheet works well with short, one sentence quotations which are easy to see and comprehend. I have a number of quote lists on this blog, which makes a good starting point to grab one for your list. A great way to start your week is with a simple fast planner. 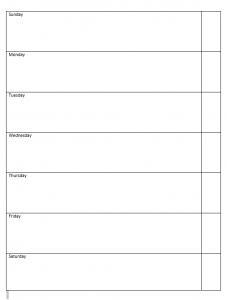 Just download our template and spend a few minutes planning out each day. The easiest way to get started is to pick one priority item for each day that you want to get done. Don’t overthink this. Here is the simple planner. Just grab a pen, pencil or Sharpie and fill in each day with a unique priority. Using a pencil makes it easy to erase, while a Sharpie makes a bold statement. 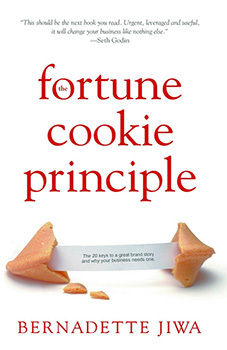 I just finished a fascinating book by Bernadette Jiwa, entitled the Fortune Cookie Principle. In this powerful little tome, the author suggests that in marketing, “It’s not how good you are. It’s how well you tell your story. ” She uses the analogy of a Fortune Cookie. It’s not much on the outside, but it contains a powerful little story on the inside. As a long time Toastmaster, I’ve learned the power of stories. They work well. So after reading Bernadette’s book, I asked the question… If I put three cookies on a plate; a chocolate chip, a peanut butter, and a fortune cookie, which one would you take? As much as I agreed with Bernadette’s premise about story, I had a little trouble with this question. You see, I don’t like fortune cookies very much. They taste rather bland at best, and sometimes they are downright awful. If I was hungry at all, I would take one of the other cookies in a heartbeat. My hunger would outweigh my curiosity for the fortune. So then I got to thinking. I put my design hat on. 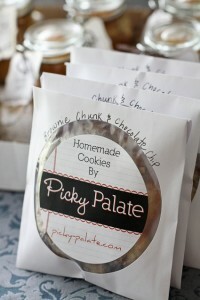 How about putting a fortune in a chocolate chip cookie? The result was an utter mess, with the chocolate chips melting on the fortune. The same think happened with the peanut butter. Nice idea, but an abject failure. I was just getting ready to kiss the idea off when.. 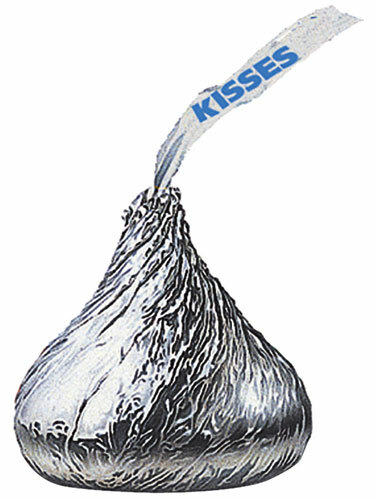 I thought of the lowly Hershey’s kiss, a delicious foil rapped chocolate miracle. I could wrap the fortune around the outside of a chocolate chip cookie. At first, my ideas didn’t work. A foil wrapped cookie didn’t look delicious at all. The foil hid all the goodness inside. It was bland and plain. Then I though of what type of package I could wrap it in. I thought of Steve Jobs at Apple, with their amazing packaging used to enhance the experience of unwrapping almost all of their products. This brought ideas of gift wrap and ribbon. 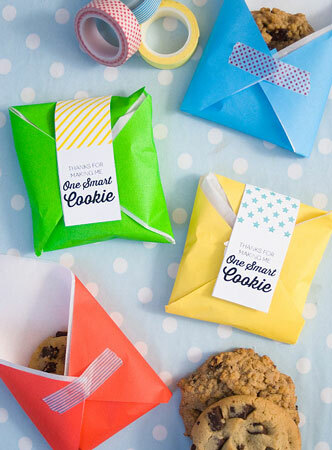 Now the idea of a wrapped cookie was more appealing. Beautiful outside, but what about the inside? A regular fortune certainly wouldn’t do. It had to be a story. A good story. Actually for you, this needs to be an incredible story. 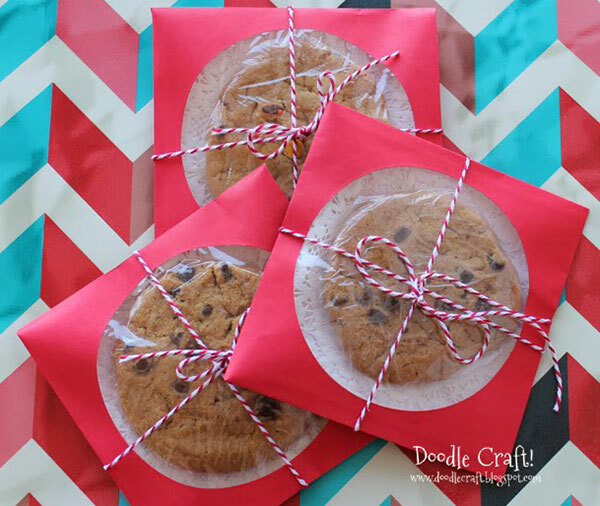 So here is what I came up with… Put the best cookie on earth in great gift wrap and include a card inside with an amazing story or quote. How about you… What would your ultimate fortune cookie look like? Four Little Words That Motivated Me Like Crazy To Do Impossible Things. I’ve sat through a lot of motivational programs, watched many motivational YouTube videos, and have had many mentors encourage me over the years. Through it all, nothing has motivated me like these four little words. Four words that actually have been said in many different ways over the years, and by different people. I wish I could say they should be written down and copied. But really, they shouldn’t. Sometimes I wish they had never been said, but then I rescind. You see, these four little words are extremely powerful. They can cut you down, or in my case, lift you up. The people speaking had various motives. But one thing was always true. Four little words, that had I listened and taken them to heart, would have ruined my day. But instead, they motivated me like nothing else. These are better than praise, better than a pat on the back. They are better because I didn’t believe them. And I needed to show someone the truth. The only way to show the truth! When you set a goal, the difference between success and failure often comes down to one simple factor. It’s simply how motivated you are to complete the task. When we look at motivation, I like to use a Football analogy. Take your average pro football team and your average player. What will motivate that player to success? In the graph above you can see the relative levels of motivation. They are in link step with how transparent and accountable you are. Coach: This person knows you inside out. They also hold you accountable. A good coach will make or break a player and a team. Team: Having good teammates and working as a team will help you succeed. Accountability and transparency are high. Crowd: The roar of the crowd can help motivate you to success. However, crowds can be unpredictable. They can easy turn on you. Television or other Media: Doing well on TV can be a motivator, but when you are on the field, you are far removed from the screen. Subconscious: You would think that your own mind would be your greatest motivator, but for most people this just isn’t true. You are far more likely to let yourself off the hook than any of the others. Let’s look at how these line up on our Goal Chart from yesterday’s post. Our expertise makes our tasks easier over time. The more we know, the more likely we are to move to success. As we can see the danger level is in the focused area in middle. I’ve been here so many times in my life. I get started, dead focused on the task, but I’m unable to finish the project because the level of complexity made it much harder to do than I expected. Motivation waned, and I usually gave up. For success, I really needed to bring in others and use their expertise and motivation. 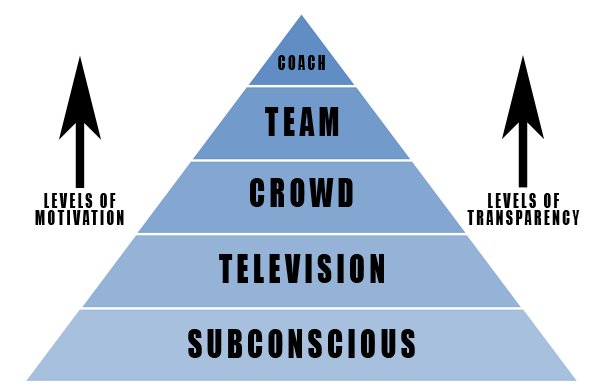 When I’ve been part of a team, or hired a coach, the project usually gets completed. The low end of the graph is where simple habit change comes in. The simpler the change of routine is, the more likely we are to see success. When I have made simple changes to existing habits, they work almost like magic. Let me give you an example of both ends of this graph and how they affected me. Back in 2008, I set a goal to write my first fiction book. I had never written fiction before, so to complete the writing and get a finished book would take a lot of motivation and expertise. Here is how it worked out for me. Habit Change: I changed to writing fiction instead of non fiction in the morning. Results: A first attempt at fiction. 80,000 words in four months. The first round went rather well. I had an ingrained habit already created of writing from 4am to 6am. I just changed the habit from writing blog posts, to writing fiction. At first it was a little clumsy, but I learned quickly along the way. My first draft was OK, but certainly not where I wanted it. This is where the project would have stopped had I not brought in a writing coach. My writing coach took five chapters at a time, made corrections and offered suggestions. She took my clunky sentences and worked magic. The edited prose was very motivational. I learned from her at each step and made her suggested corrections, motivated to get better as I went. I compiled the final edit, and had beta readers comment. It actually sounded good. 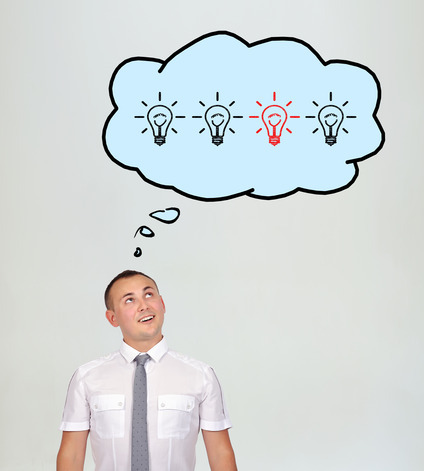 My takeaways for developing a successful goal setting strategy. Changing an ingrained morning habit made the initial writing easy. I just wrote fictional stories, instead of blog posts. My goal would have ended at the first draft had I not brought in a writing coach. I didn’t have the expertise or the motivation to finish without her. The more I learned about writing fiction, the easier it became to write well and the more motivated I was to edit and finish the book. 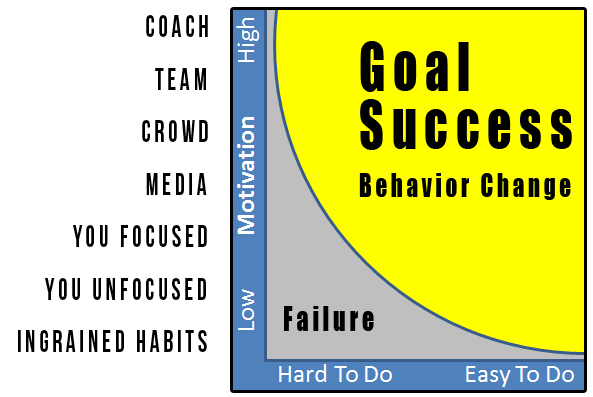 I need to use this graph to figure out when I need to bring in a team, hire a coach, or go out to social media for help. So many of my goal failures have been the result of trying to do everything myself. Bottom line. If you have a difficult goal you want to accomplish, make sure you bring in others to help. It may be a coach, small group, mastermind, or leadership organization. Tomorrow we’ll take a look at the bottom end of the graph and see some amazing ways we can change existing habits to do amazing things we never thought possible. We’ll compose some Blended SMARTER Goals. Stay tuned.